Inter-disciplinary artistic practices are becoming more commonplace in the contemporary art world, with Jumana Emil Abboud encapsulating this perfectly. Her practice encompasses a broad variety of media ranging from painting and drawing, to performance, video and installation. Abboud’s shifts in location throughout her life fuels a sense of displacement and themes of memory within her work. Born in Galilee, Abboud moved to Canada with her parents in 1979 and currently lives and works in Jerusalem. Cultural history and personal heritage are therefore intrinsic to her practice, with the explorations of Palestinian folklore and local myths allowing her to reclaim the sense of belonging to her homeland. 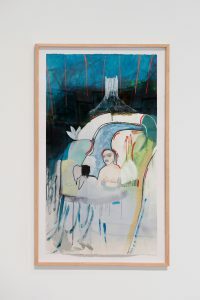 Abboud’s drawings adopt a naive and almost childlike aesthetic in their depictions of these fairytales; pastel and gouache form the base materials of sketches as she tries to reconnect with a culture that she feels is detached. The drawings have a ghostly presence, they hint at a past, at countless stories and tales that elude the viewer, as no fixed narrative can be applied directly. To accompany these framed works, a serene female voice narrates folklore extracts that can be heard over the headphones that each viewer is presented with upon entrance. This introduces a multi-sensory, disjointed and abstract correlation between the audio and visual studies, each framed and presented in collage form on the wall. 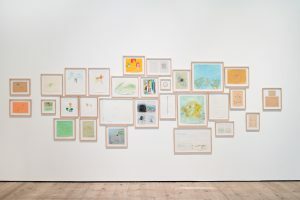 The viewer’s eyes travel across the exhibition space absorbing the drawings and paintings as they expand across the wall, echoing Abboud’s expanding knowledge of her cultural heritage. Alongside this drawing montage sits the video-poem I Feel Nothing (2009), which was filmed in locations throughout Palestine as well as at a Museum of Archaeology. Exploring notions of touch and territories, it is composed of fleeting imagery shifting between classical sculptures stood proudly on red and green plinths that are caressed by human hands, and cascading outdoor landscapes of Palestine. Themes of death and loss are also illustrated within this uncanny yet mesmerising film. Soothing audio accompanies this video-poem with epic language and story fragments illuminating the powerful visuals. Phrases such as ‘walking among the ruins on the way to the past’ are beautiful illustrations of Abboud’s personal journey and the wonders that she discovers in search for both herself and her heritage. 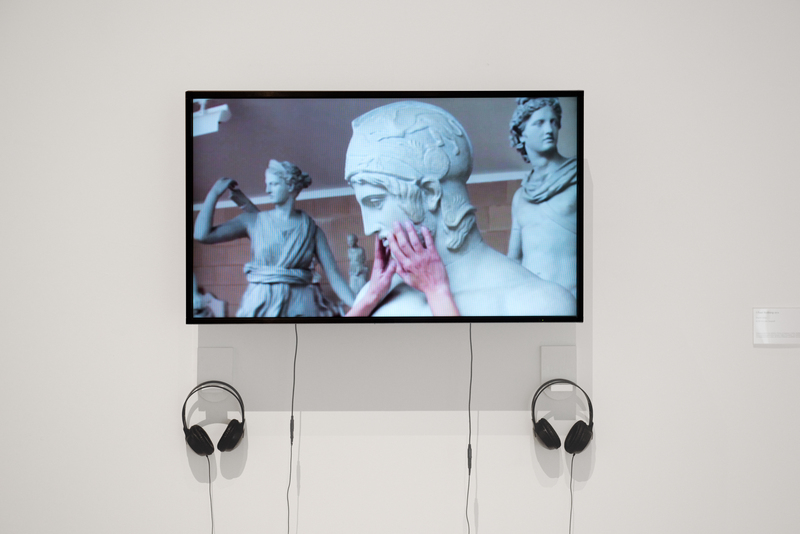 In the second gallery space three large screens greet the viewer upon entrance to the room; the centre screen is stood directly facing, with the framing two slightly angled creating an experience accounting for peripheral vision. Consequently, the viewing of these screens becomes an all-consuming experience in which one is fully absorbed by both the natural landscapes and cityscapes depicted. As a storm rolls in and rain begins falling heavily over the urban scenes of Palestinian, it feels as though it would not be surprising if rain started falling from the ceiling of BALTIC, or if wind began to flutter through your hair. The screens fully absorb their audience into them as horses and goats canter across lush green scenery and the sunsets over the cityscapes of the screens. The sound of flowing water casts an air of serenity across the audience (some of which choose to keep wearing their headphones from the first space, others casting them aside). Yet the blend of the two audios creates an effective and multi-layered narrative that disjoints and subverts the natural scenes on the three–way screen. It is subtle, yet becomes increasingly apparent if watched repeatedly, as the syncing of the three screen plays and dictates the narrative. In particular frames, two screens depict the same image with the third screen slightly different. In others, the imagery is the same throughout all screens, but set at different time lapses. The sense of disruption and confusion echoes Abboud’s personal shifts. Screens change constantly, much like Abboud’s own cultural links and it is perhaps this fumbling attempt at trying to make sense of an elusive narrative where images inform and suggest but also disrupt, perhaps symbolising the artist’s determined search for self. Jumana Emil Abboud continues at BALTIC Centre for Contemporary Art, Gateshead until 2 October 2016.